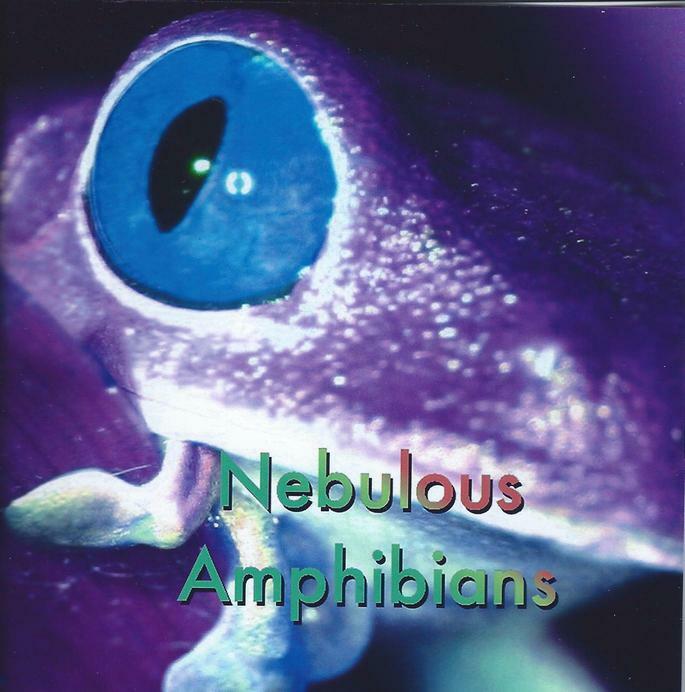 Nebulous Amphibians is the trans-Atlantic duo of Leeds, UK based David Sanderson on guitars, bass and synths, and San Francisco based Jon Drukman on synths and programming. This 5 track, 31 minute all instrumental set opens with Ethernet Fry-Up, a space rocker that incorporates jazz and prog elements. Right out of the chute it sets a rapid-fire Ozric-like synth pattern that keeps the music in high energy space rock mode, though they take a break when the first guitar solo kicks in. David is a damn good guitarist and my favorite part of the track is near the end when the duo kick into full band space rock mode with guitar wailing, synths swirling, and percussion rocking. Supernebula is next and opens with heavenly astral keys, soon joined by Bluesy guitar. We float along until around the 4 minute mark when additional synths create a cosmic rhythmic pulse and soon we’re rockin’ and groovin’ in space. The music ventures into dance mode and then David takes off with a blistering guitar solo, soon settling into a hip shakin’ groove that kept my head boppin’ as I watched the comets soaring by. Arza Lint is a high energy space rocker that’s firmly in Ozrics mode, though I’d say Nebulous Amphibians maintain their identity with the grooves that characterize most of these tracks. I like how the music shifts gears and transitions to jazzy spaced out dreamland for the finale. Dimensionless is a short piece that leads into the final track, Binarium. The song starts off dark and moody, but our spirits are quickly lifted when the space synths and grooves kick in. It’s a nice combination of heavenly meditative synths, jazzy guitar and cool grooves, plus a high octane rocking section. Ozric Tentacles are the closest analogy to what these guys are doing, though Nebulous Amphibians are heavier on the dance grooves while never straying far from the ROCK. I received this CD along with a David Sanderson solo project called Superstring Phobia, and I’d say both must be considered together to get a feel for what he is about. Both are excellent but I’d say that if David got a band together he’d be seriously dangerous. CLICK HERE to read the Superstring Phobia review Pat wrote and note that all this music can be heard at the Soundcloud links below.